Drivers sending a text or finding the right Snapchat filter could face an additional $100 fine if pulled over for a moving violation. House Bill 95, proposed by state Reps. Bill Seitz, R-Cincinnati, and Jim Hughes, R-Upper Arlington, on Feb. 27, enhances the penalty for moving violations if the driver was distracted on a smartphone. Violators would have to pay a $100 fine in addition to other fines. Athens Police Department Chief Tom Pyle said although texting and driving is “horrendous,” he is unsure if the bill would actually change anything. More than 80 percent of drivers cite distracted driving as a serious problem that makes them feel less safe on the road, according to the annual AAA Foundation Traffic Safety Culture Index, yet in a CDC report analyzing data from 2011, 69 percent of people said they talked on the phone while driving within a month of participating in the research. More than eight people are killed and 1,161 are injured in crashes that involve a distracted driver each day in the United States, according to the CDC. “It really freaks me out when I see other drivers next to me on their cell phones because it’s putting myself in danger, and if they could just stop at a stop light or pull over to send the text that would be so much more beneficial,” Emily O’Flynn, a sophomore studying journalism, said. Cell phone addiction is a big problem, Emily Krause, a junior studying organizational communication, said. The bill was referred to the Transportation and Public Safety committee March 7. Originally published for The Post on March 28, 2017. While some teachers restrict phone usage in the classroom, Amie Musselman encourages it in the form of a history app she developed for students. Musselman, a junior studying middle childhood education, created the app “D-Day” through a web-development site “Aris” in an attempt to educate students about the historical raid of the Normandy beaches in a unique way. The “D-Day” app is available to download through the Aris app, which is free to download on the App Store. There are nine outcomes of the game, three of which result in the player surviving and winning the game and one of which allows the player to receive a purple heart. The game starts with a YouTube video of U.S. President Dwight Eisenhower’s speech over footage of D-Day. The player must then select where they are going. The player is then offered an array of choices to consider in a war scenario. The game also allows the player to interact with real historical figures, including President Theodore Roosevelt’s son, who was a key figure during the invasion of the Normandy beaches. If the player does not survive, the game will loop to the beginning and they can try again. If they succeed, the game ends with a clip of footage from World War II. Musselman first created the app with a partner her freshman year as part of a class to incorporate education into mobile media. She hasn’t changed the content, but has made “minor tweaks” to the game. As part of her education in the Patton College of Education’s honors program, Musselman is required to develop a thesis and conduct a research project. In February, she went to a high school to conduct her research study in an American history class. Prior to her arrival, the teacher gave the students a lesson on D-Day. Musselman collected data from 87 students utilizing a pre-survey and then had students play her game. Following the game, she had students take a post-survey. She said about 10 or 15 more participants said the app improved their enjoyment of social studies. Musselman said teachers’ backlash is not realistic and rather than banning technology, they should embrace it. 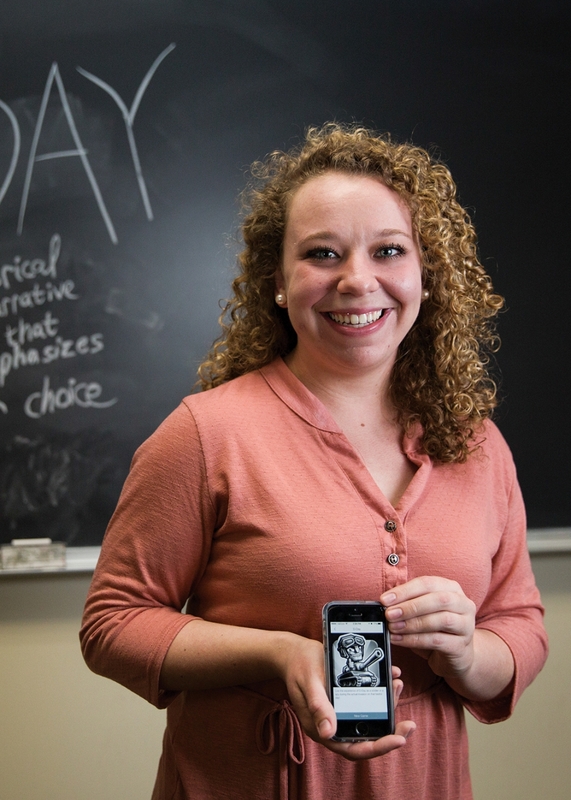 She said technology is integral to teaching in a modern-era and she hopes her app will help students become passionate about history and learning. Originally published for The Post on March 23, 2017. Former Ohio University President Roderick McDavis released his final presidential report Tuesday, chronicling accomplishments under his administration. Rather than discussing university achievements in the past year, reviewed his time in office holistically, McDavis stepped down Feb. 17 to assume a position at a higher education search firm. OU also fosters the right environment for bright students and faculty, McDavis said. The university is a top producer of Fulbright-award students and five professors were named members of the National Academy of Inventors during his time here. The Honors Tutorial College is ranked one of the top 20 programs nationally. McDavis said his top priority when he assumed the presidency was increasing diversity. One of his first actions at the university was implementing the Ohio University Diversity Initiative. His administration also created the position of vice provost for diversity and inclusion. He also created the Urban Scholars and Appalachian Scholars programs to include students from a variety of regions. As a result, enrollment of minority students has increased by 170 percent, and international student enrollment is up 73 percent in the last 12 years. Under McDavis’ presidency, initiatives like the OHIO Guarantee were secured into place, making college more affordable, he said. Beyond student cost, his administration has worked to ensure financial security under the Century Bond Debt Management Plan, which will generate $1.4 billion without debt over the next 100 years. In addition, the Promise Lives Campaign raised half a billion dollars, $325 million of which will be used for faculty and research, academic programs and scholarships. Another $114 million will go toward building renovations and capital projects, which has been a main priority during his administration, with 12 new or renovated building projects and the first residence halls built in 30 years. The remaining $60 million will be used for other university programs. OU’s relationship with the City of Athens, which was named America’s Best College Small Town by USA Today, is the best it has ever been, McDavis said, with increased partnerships like joint safety patrol and improved public transit. He has also worked closely with branch campuses. McDavis received the honor of 2016 Business Person of the Year from the Dublin Chamber of Commerce for all his work with the Dublin branch, including a partnership with the city to create a professional theater group. The university also has 20 regional community college partners where students can complete two years of coursework toward an OU degree closer to home. Although McDavis is no longer president, he said his aspirations for the university continue. In the report, he said he looks forward to the completion of the Campus Master Plan and a continuation of support for students, faculty and research. Originally published for The Post on March 21, 2017. Ada Adams was refused service at some Uptown restaurants. She was not allowed to complete her student teaching in Athens County. She was unable to join Ohio University social sororities and fraternities. All because of the color of her skin. A 1961 graduate, Adams grew up in Nelsonville and began her education at OU in 1957, studying physical education. Her boyfriend at the time, who later became her husband, was Alvin C. Adams, a Morgan County native and, in 1959, the first black man to graduate from the E.W. Scripps School of Journalism. “A professor once told him he was grading him harder than the white students because he would have a hard time in life getting a job in the profession of newspaper reporting,” she said of her late husband. In order to complete her education, Adams was required to student-teach, but she said OU had an agreement with local schools that no black students would be sent to teach. Following their marriage in 1960, the couple moved to Chicago because Alvin could not land a reporting job in Athens County. He started at The Chicago Defender, a black newspaper, but soon after began writing for Jet Magazine, a weekly targeted toward African-American readers. He spent much of his time covering the civil rights movement while Ada taught at a middle school. The two took a leave from their jobs to help organize and assist in furthering the efforts of the civil rights movement. They spent most of their time registering people to vote and transporting speakers to and from Southern cities. Following their work with the civil rights movement and their retirement, the Adamses moved back to southeastern Ohio in 1999. The two also wanted to return to research their genealogy. After an extensive period of time, Ada was able to confirm her ties to founding father Thomas Jefferson and his slave Sally Hemings. She said through research conducted at various libraries, historic centers and courts, she was able to come up with documentation of her relations to Jefferson and Hemings. She said she has visited Monticello, Jefferson’s Virginia home, to celebrate and honor descendants of the union. Following her husband’s death in 2004, Ada was pleased to hear the university would be honoring his memory by naming Adams Hall on South Green after him in 2007. Jasmine Lambert, a senior studying political science and journalism, met Ada at an event co-sponsored by Ohio University’s Association of Black Journalists, an organization of which she was the president. Lambert said Adams is a “super sweet lady” whose presence at the university is inspirational. Adams said she plans on continuing her involvement with the students at OU. Originally published for The Post on March 19, 2017. Flocks of Ohio University students could be spotted sporting shamrocks on Court Street to celebrate Green Beer Day on Wednesday. Green Beer Day is a product of when OU was on the quarter system and St. Patrick’s Day fell during spring break. As a result, students opted to go to the bars early and drink colored beer to celebrate. The tradition was taken from Miami University, but OU stuck with it after the switch from quarters to semesters in 2012. Despite the origins in Oxford, some students argue Athens has made Green Beer Day its own. “It’s a good way for everyone to celebrate OU in its own way,” Baileigh La Rue, a junior studying fashion merchandising and product development, said. The beer’s festive color typically comes from manufacturers, not the bars themselves, according to a previous Post report. As for the taste, Michelle Mwaura was not too pleased. Although some students decided to blow off steam after classes, others opted to hit the bars early. Jaleeka Freckleton, a junior who lives above The Pigskin Bar and Grille, said she feels as though she has to join in on the fun. Dylan Pickering, a senior studying communication and media management, spent his first Green Beer Day with his friends and said he was having a great time so far. Originally published for The Post on March 15, 2017. Fifteen of the 70 Ohio University students arrested under the charge of criminal trespassing during the Baker sit-in Feb. 1 pleaded “no contest” at the Athens County Municipal Court on Thursday morning and accepted a reduced charge of disorderly conduct. A group of about 300 people gathered in front of the Athens Courthouse on Feb. 1 to protest President Donald Trump’s immigration ban, barring people from seven predominantly Muslim countries from entering the United States. The protesters began marching down Court Street through traffic to Baker University Center at about 5 p.m., where they congregated on the fourth and fifth floors. They said they planned to occupy Baker until university officials declared OU a “sanctuary campus,” a non-legal term used to limit cooperation with federal immigration services. At approximately 7:25 p.m., OU Police Chief Andrew Powers announced officers would soon begin arresting individuals who did not leave the area after creating what OUPD later called an “unsafe condition” in a news release on Twitter. OUPD began arresting people who did not comply with their request at about 8 p.m.
Those students were charged with criminal trespassing, a fourth-degree misdemeanor that could lead to up to 30 days in jail and a $250 fine. OU interim President David Descutner sent an email to students, faculty and staff Wednesday in support of OUPD’s decision not to drop the charges, though he did acknowledge students’ rights to protest. Fifteen of those students accepted the plea deal at Athens County Municipal Court on Thursday morning, while five requested a bench trial, a trial by judge rather than a trial by jury. The other individuals who were arrested requested for their trial to be deferred and did not waive their right to a jury. Originally published for The Post on March 2, 2017. Athens residents and Ohio University students rallied in support of the “Bobcat 70” following their appearances in court Thursday. About 40 people gathered in front of the Athens Courthouse after the students arrested during the Baker sit-in on Feb. 1 appeared in the Athens County Municipal Court on Thursday morning. Fifteen of the 70 charged with criminal trespassing pleaded “no contest,” accepting a reduced charge of disorderly conduct. The rally was organized by Appalachia Resist, an organization of Athens County and Meigs County residents who focus primarily on local environmental advocacy. Protesters during the sit-in demanded OU officials declare the university a “sanctuary campus,” a term used to describe universities that limit their cooperation with federal immigration services. The rally was a good way to show solidarity, Bobby Walker, a senior arrested during the sit-in, said. Attendees stood near the street holdings signs with phrases such as “Support Bobcat 70” and “Refugees are welcome here.” Some demonstrators sat on the courthouse steps, talking and eating baked goods provided by Claire Seid, a member of F—RapeCulture. “As someone who believes in the cause that my friends got arrested for, I think it’s important to support them in all ways we can, including baking, showing up, providing emotional aid, contributing to the legal fee fund, showing up to rallies and protests, helping organize,” she said. The Athens community should continue to pursue the work of the “Bobcat 70,” Peggy Gish, an Athens resident, said.